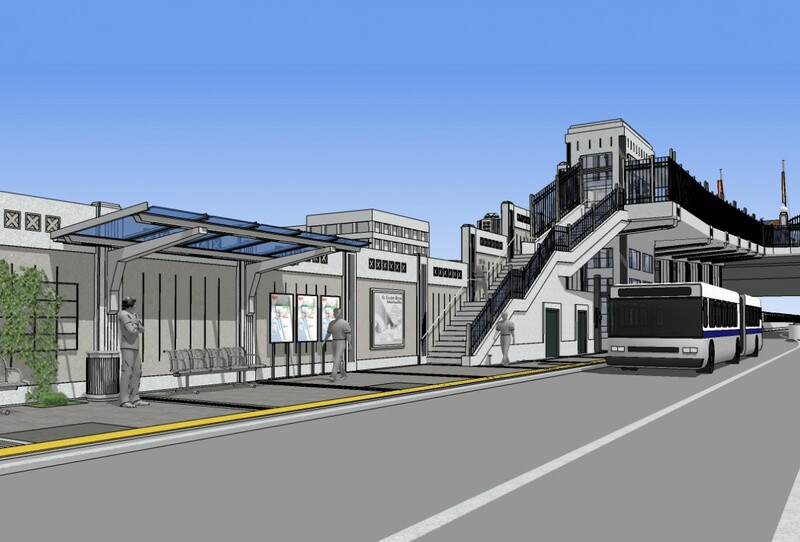 Rendering of a bus station to be built in City Heights, San Diego. Imagine that an infrastructure project promised to your community 30 years ago is finally coming to fruition. You’ve had decades to picture what could have been. Would you be frustrated about the wait? Excited about the result? This is how residents of San Diego’s City Heights neighborhood feel now, after a long-awaited transportation project recently received the funding needed to go forward. In the 1980s, Caltrans — the state agency responsible for development and maintenance of highways, bridges and railways — split the City Heights community in half with the construction of a new freeway, Interstate 15. To compensate the neighborhood, officials promised a rapid bus line, known as the Centerline, which would end up costing $45 million. It took until last year for the remaining funds to be identified. City Heights, which covers part of southeastern San Diego, has been a fast-growing community since the 1960s, when many of the neighborhood’s original single-family homes were replaced with multifamily apartment complexes. This increase in density aimed to fulfill new housing demands throughout the area. As the population grew, so did the proportion of low-income residents. The city decreased investment in the neighborhood as a result, and crime rates increased. Businesses began closing their doors. Two decades later, Caltrans approached the community with what seemed like a good deal: If residents supported the construction of a new freeway through the middle of their neighborhood, Caltrans would work with the City Heights Community Development Corporation to establish a plan for compensating the community. Known as the Visions Project, the proposal submitted to Caltrans called for an eight-block cover over the freeway. The development was to include a town square with shops, restaurants, markets, a library and a community center. The 1980s redevelopment plans also promised an express bus lane that would run parallel to the new freeway, connecting City Heights to job centers across the San Diego area. The community’s rate of transit ridership is four times the national average, so the Centerline was set to become an important tool for economic development and expansion. Caltrans rejected the freeway cover but agreed to fund the Centerline, recognizing how it would improve the regional transportation network. More than 20 years later, the agency has finally found the funds to give the Centerline the green light, with expected completion in 2015. Located at freeway level, the Centerline bus would load City Heights passengers from two stops linked to the neighborhood by elevators. According to the City Heights CDC, the Centerline will have a huge effect on work commutes, decreasing travel times and increasing job options available to residents. Today the City Heights and the CDC can breathe a sigh of relief. Yet for some neighborhood advocates, the Centerline is just the first of many accomplishments to come. Community members will now focus on incorporating the work of local artists into the design of the Centerline stops. They will also advocate for the extension of the San Diego trolley to one of the Centerline stops, further increasing the neighborhood accessibility. The Center on Policy Initiatives, a grantee of the Surdna Foundation, is a nonprofit research and action institute dedicated to advancing economic equity for working people and diverse communities throughout the San Diego region.